It was beginning to feel like the journey to get to the Sal Salis would never end. A 6am flight from Melbourne to Perth was met with a 4 hour layover before hopping on another 2 hour flight to Exmouth. It’s another 90 minutes in the car, with faint glimpses of mobile phone reception, before you arrive at the lodge. Finally your bags are whisked off in a golf buggy whilst you walk along a path through the bush, along the ocean, to a warm welcome at Sal Salis. After a refreshing aperitif and a hearty chat with lodge staff, you’re promptly shown your eco-tent. 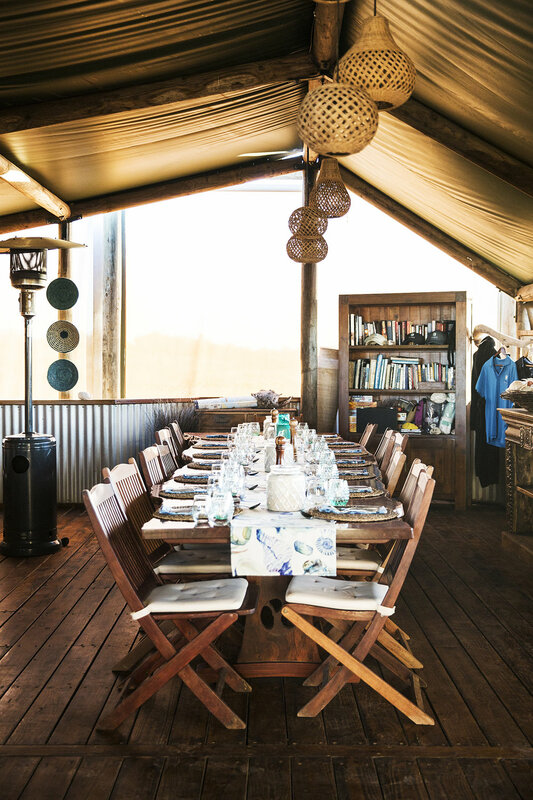 There are only a few camp grounds in the sprawling Cape Range National Park and Sal Salis is the only luxury campsite, with permanently fixed tents that are entirely solar powered. Forget the mod cons, you don’t have Internet access or cell phone reception. Your toilet is eco-composting, your bathroom tap has to be pumped by hand and you’re rationed 20 litres of water per day for showering. But this is all part of Sal Salis’ charm and it’s incredibly easy to live within these measures. The rooms are bush-luxe, with plush beds adorned with cotton sheets. Teak furnishings accent the generous sized tent, which is fitted with wooden floorboards and solar powered lamps. There’s even a USB port to charge your tech, but by the end of your stay you forget about your phone and focus on being present in the moment. Depending on the time of year, you can book in with Sal Salis’ partner Live Ningaloo to swim with the Whale Sharks. 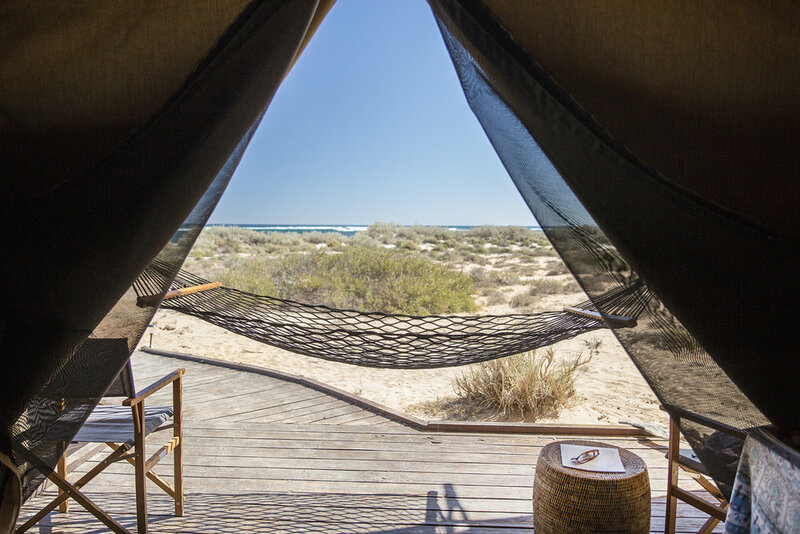 Live Ningaloo is one of the smaller operators in the region, committing to only taking up to 10 guests on a trip at a time (the majority of the others take up to 20). This means longer swims and better visibility when in the water with the Whale Sharks. The boat works in conjunction with a spotter plane that searches for Whale Sharks in the ocean. As soon as one is spotted, our captain is full steam ahead to get to the fish before it dives down. We’re all in the water in seconds and swimming within metres of these huge creatures. In a few moments the fish have gone and we’re off searching for another. We visited near the end of July when the Humpback Whales were starting to migrate through the area. It was incredible to see these giants emerge from the sea right in front of our eyes in huge numbers and starting in August you can book in to swim with the Humpback Whales. The lodge schedules several optional activities for guests each day. There are intense walks through the nearby gorges, snorkeling at one of the many pristine beaches or you can set yourself up on Sal Salis’ remarkable pink pebble beach and swim in the crystal blue water. Food at the lodge is outstanding with the chefs going above and beyond to accommodate dietary requirements. Breakfast and lunch are taken at leisure, with options provided from a menu and cooked to order. Smashed avocado with poached eggs and thick-cut WA bacon is a real winner and the American-style pancakes are perfectly fluffy. There’s an included help-yourself bar that’s full to the brim with drinks from Western Australia such as Sauvignon Blanc and Cabernet from Margaret River, beers from Broome and spirits like Gin made in Perth. During the afternoon you might find treats like carrot cake with cream cheese frosting tempting you in the lounge and in the evening canapés are served on the deck as you watch spectacular sunsets. Dinner is a magical experience, with long tables set up with twinkling lanterns for communal dining. Chef prepares a 3 course menu which can consist of dishes such as fresh caught fish with mango salsa, pan seared duck breast and deconstructed lemon meringue pie. Paired with matching wines, the nights are filled with conversation with other guests under a starry sky. Feasting and pampering aside, it’s the smaller moments that make Sal Salis special. 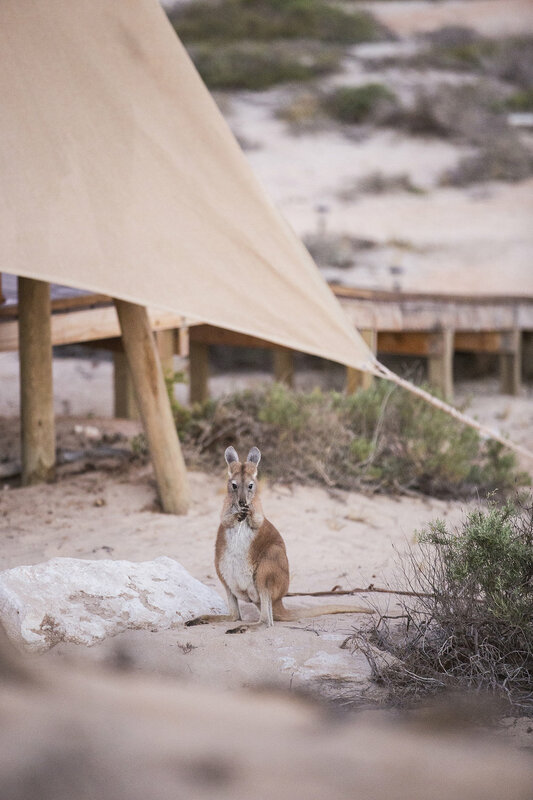 Spending sunrise on the sand dunes with a handful of curious Wallaroos is incredibly intimate and you begin to wonder how you survived before daily afternoon naps in your tent hammock. You’ve forgotten what emails are and the thought of phone reception seems like a burden. 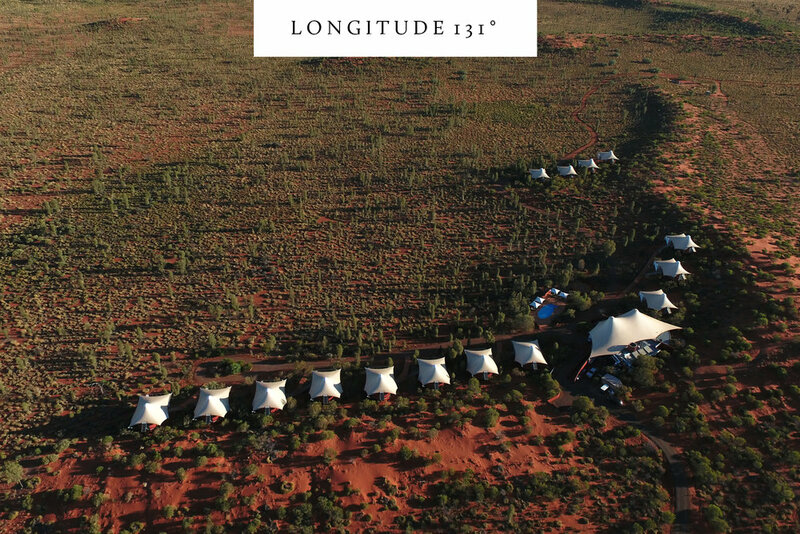 It’s here at Sal Salis, totally disconnected from the rest of the world that you start to feel connected to this wild, untamed region of Australia. And that’s the real luxury. MINI BAR: Water in your tent is refilled throughout the day by staff. Snacks and an open bar is located at the main lodge. POOL/GYM/SPA: None. Hike the gorges, swim in the ocean and nap in your hammock. LOCATION: A 90 minute drive from Exmouth. CHILDREN: Yes, over 4 year olds allowed. RESTAURANT/BAR: The lodge includes all meals alongside and included open bar. Inclusive of all meals and some activities. Whale Shark/Humpback Whale tours and transfers extra. I travelled courtesy of Western Australia Tourism. I stayed courtesy of Sal Salis.